498 pages | 239 Color Illus. | 49 B/W Illus. 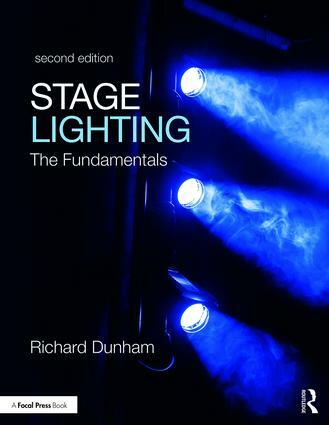 Stage Lighting: The Fundamentals is written specifically for introductory stage lighting courses. The book begins with an examination of the nature of light, perception, and color, then leads into a conversation of stage lighting equipment and technicians. Lamps, luminaries, controls/dimming, and electricity form the basis of these chapters. The book also provides a detailed explanation and overview of the lighting design process for the theatre and several other traditional forms of entertainment. Finally, the book explores a variety of additional areas where lighting designers can find related future employment, such as concert and corporate lighting, themed design, architectural and landscape lighting, and computer animation. updated designer profiles along with the addition of still more designer profiles. Richard Dunham is a scenic and lighting designer as well as a professor and head of design at the University of Georgia. He is a United States Institute for Theatre Technology (USITT) Fellow and former lighting commissioner from 1998 to 2006. His professional credits include numerous productions throughout the East Coast, New York City, and the Midwest, as well as being Lighting Certified (LC) and a member of Illuminating Engineering Society of North America (IESNA) and associate member of the International Association of Lighting Designers (IALD).